Is There Really Any Question Who America's NFL Team Is? The term America's Team is a nickname that refers to the Dallas Cowboys of the National Football League. The nickname originated with the team's 1978 highlight film, where the narrator opens with the following introduction: They appear on television so often that their faces are as familiar to the public as presidents and movie stars. They are the Dallas Cowboys, "America's Team." First off, I hate that nickname. Not because I'm a Steelers fan, and not because I hate the Cowboys. I hate it because I don't think it's true. The Cowboys are a very popular team and have been one of the most successful franchises in the NFL and all of pro sports.The Cowboys can have the name "America's team" but I don't think they truly are "America's team." The Pittsburgh Steelers' fan base is more loyal and travels way better than the Cowboys'. While the nickname has stuck with the Cowboys, few know the real story behind the name. The Steelers were actually given the nickname before the Cowboys. However, Steelers owner Art Rooney dismissed the suggestion that the Steelers were America's Team. "We didn't want that," Rooney said. "We're Pittsburgh's team. We feel strongly about that."Mr. Rooney realized how much the team meant and still means to the city of Pittsburgh. No other NFL team embodies the city in which it plays, and the people it plays for, as well as the Steelers do. The Steelers and their fans have a connection that is unlike any other I've ever seen. When it comes to the NFL, I think only the Steelers, Packers and Cowboys have a serious argument when it comes to having the best fan base in the NFL. Packers fans travel well and are extremely loyal. The Packers are one of the most successful franchises in all of sports, especially the NFL. Green Bay won six NFL championships from 1929 to 1944, where the league size was 12 teams (a 1-in-12 chance of winning). It was a much easier feat to win then. Green Bay won five titles in the 1960s, where the league size ranged from 22 to 25 teams. This is also the decade where the NFL and AFL were beginning interplay. So most of the Packers' success came before the AFL and NFL banned together and created the Super Bowl. Since the merger, the Packers have three Super Bowl titles and are making their fifth Super Bowl appearance. All that is great, but the Packers fan base isn't as big as Steeler Nation. I can't go down Carson Street in Pittsburgh and go to a Packers bar. However, I can go to any state or almost any country and find many Steelers fans and Steelers bars.I bet I could even go downtown Dallas and find at least one Steelers bar. The Steelers were the team of the '70s. They won four Super Bowls and had arguably the most talented team in NFL history. Steeler Nation was in full force. Then the steel mills started to close down and a lot of people lost their jobs. Most Pittsburghers were forced to move out of the city or state and find work. This is obviously the main reason you see so many Steelers fans at opposing teams' stadiums when the Steelers come to town. Steeler fans are everywhere in this country. Not only do I think the Steelers have the best fan base, I think they're now the best, most successful franchise in the NFL. After beating the New York Jets 24-19 on Sunday, the Steelers will be looking for a record seventh Super Bowl title against the Green Bay Packers on Feb. 6. The Steelers also tied the Cowboys for most postseason wins with 33, and set a new mark for most postseason home wins with 20. If they beat the Packers in the Super Bowl they'll have two more Super Bowl victories than the Cowboys in the same amount of appearances. The Steelers are successful and do so without buying many big free agents. They're a classy organization that believes in teamwork, handwork and building from within. If you still want to call the Cowboys America's Team, that's fine. But the Steelers truly have the best fans in the NFL. Steeler Nation is way stronger than the Cowboys fan base and it will show when half of the Cowboys' brand new stadium is filled with black and gold jerseys for Super Bowl XLV. 1 Half Is Better Than None! I know we're in the Super Bowl. And as a Steelers fan I should be ecstatic. I know Ben Roethlisberger made a terrific play to pick up the 1st down that iced the game for the Steelers in the final 2 minutes. But, the Steelers only played one good half. The Pittsburgh Steelers played like Super Bowl champs in the 1st half to lead the New York Jets 24-3. But, as the 2nd quarter ended the defense allowed the Jets to march down the field with sloppy play, poor tackling and stupid penalties. Right then I felt that those 3 points shifted the momentum of the game. And just like Lee Corso on ESPN's College Gameday, I was saying "Not so fast my friends." At half time people were calling my house and telling me what a total beat down the Steelers were going to put on the Jets. Even my wife whose watched every Steelers game with me this year and knows how the Steelers leave teams hanging around and make every game a heart attack, she was just beside herself with optimism. I had to put out the caution flag to preserve my own sanity. "Don't you remember the lousy 1st half we played against the Baltimore Ravens? ", I asked. "And didn't we play an awesome 2nd half to beat them?" Could it happen to the Steelers? Well no on expected the Jets to do the same thing to us, but maybe the Jets. The Steelers came out flat on defense in the 2nd half. It was like we knew we won and just wanted to let the time run out, not have any turnovers and move on to the Super Bowl. The only thing was, there was too much time left to waste! A lot can happen in a half with a team as desperate as you are to win a championship. If we could make adjustments to turn the game around against Baltimore, so could they. And they almost did! In The NFC championship game we saw the Green Bay Packers only play half a game with the Chicago Bears and almost let a 3rd string quarterback beat them. Let's hope the Steelers have a better half than the Packers do in Super Bowl XLV. And why not play two good halves? That might give us our 7th Lombardi trophy. Go Steelers! PITTSBURGH — The singsong refrain rains down from the rafters of frigid Heinz Field: “Here we go, Steelers. Here we go!” Perhaps the black-and-gold faithful should add the word “again” to their familiar chant. The National Football League team with the most Lombardi Trophies on the planet is vying for yet another trip to the Super Bowl. Today’s showdown with the New York Jets marks the Pittsburgh Steelers’ 15th AFC Championship Game, the most for any team since the 1970 merger of the NFL and the American Football League. The winner goes to Super Bowl XLV, to be played Feb. 6 at Cowboys Stadium in Arlington, Texas. Tonight's game will be televised on Fox at 6:30 p.m. In Pittsburgh, the team’s quest is known as the “Stairway to Seven,” or “Knocking on Seven’s Door.” Customized song lyrics have been written and recorded to the melodies of Led Zeppelin’s “Stairway to Heaven” and Bob Dylan’s “Knocking on Heaven’s Door.” These tunes, along with the latest updates of old-standards such as “The Steelers’ Polka” and the “Here We Go” song, are but a few of the signs of the black and gold buzz saw that’s revving up in this football frenzied city. Yet, with the Steelers long ago having risen from lovable losers to NFL royalty, does Pittsburgh’s perennial playoff party ever get old? 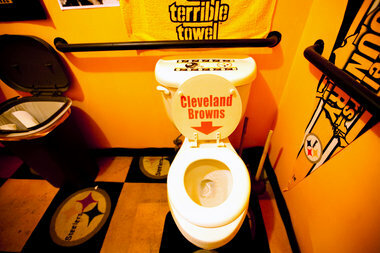 Might Pittsburgh’s football fanaticism have reached its limit? The Steelers faithful do not simply cheer on a football team. They see themselves and their city reflected in the team’s mixture of blue-collar work ethic, family ownership and tough-as-nails mentality. So when Steelers fans want to show their black-and-gold allegiance, they don’t just don jerseys and leave it at that. They make themselves part of the team, intertwining their own life experiences with those of the Steelers until the two are inseparable. City buses don’t just flash with the route number; their electronic signs alternate with the words, “Go Steelers!” Similar messages blink on traffic alert signs hanging over I-376 heading into the city. Fridays before playoff games are black-and-gold dress-up days in offices, retails stores and virtually every school, public or private, in Western Pennsylvania. In fact, one woman was overheard confiding to a friend that if she didn’t buy her daughter a Steelers’ T-shirt ahead of the championship game, the girl risked being teased mercilessly. This mother promptly picked over tables of Steelers’ merchandise outside shop after shop in Pittsburgh’s Strip District, a street of riverside warehouses known for it deals and its diversity of team gear. 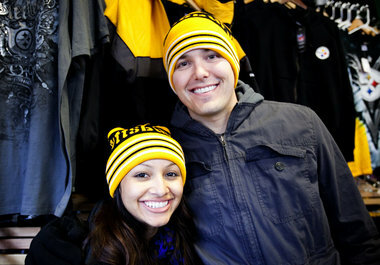 Jenny Kane, The Patriot-News Caroline Pina and Dustin Perry of L.A., traveled directly from the airport to buy Steelers merchandise in the Strip District, which they called "Steelers Street." In town for a grandparent’s 80th birthday, the couple happened to score tickets to the championship game. Now, the pair with only loose ties to Pittsburgh were getting crash courses in Steelers culture. “You don’t see this in L.A.” marveled Perry of the legions of similarly dressed Steelers fans. “We don’t even have a team.” “There’s a lot more camaraderie,” added Pina, already wearing a Steelers cap. “You go up the street, and you can feel the amount of Steelers pride.” While some teams’ fans fly their colors on game days, Pittsburghers wear their loyalty on their sleeves year-round. “When you live in Pittsburgh, black and gold is part of your wardrobe all year long,” he said. “It’s the loyalty. Hines Ward will punch his ticket to the Hall of Fame if the Steelers win this year's Super Bowl. If the Steelers complete their wild ride and win this year's Super Bowl, it will mean a lot more than the franchise's seventh Lombardi trophy. It will also mean this team is officially a dynasty, comparable even to the fabled 70s Steelers who won four Super Bowls. And, it will also mean that at least three, and probably four, Steelers have punched their ticket to the Hall of Fame. In today’s era, any team that records three Super Bowl wins in a decade time span is a dynasty. The Cowboys did it in the 90s. The Patriots did it early in the last decade. The Pittsburgh Steelers are poised to join them this year. Once a team is a dynasty, players become much more appealing to Hall of Fame voters. The four Super Bowl wins in the 70s pushed a lot of Steelers into the Hall of Fame who would not have made it had they played for a lesser team. Players like John Stallworth and Lynn Swann come to mind. The Hall of Fame is loaded with busts of those 70s Steelers while the only slightly inferior Cowboys of that period got far fewer invitations to football’s shrine of immortality. A third Super Bowl victory would lock in Ben Roethlisberger, Troy Polamalu and Hines Ward and would probably be enough to push James Harrison in as well. How many Steelers off this year's team will be locks for the Hall of Fame with a Super Bowl win? Roethlisberger and Polamalu are arguably well on their way to Canton already. Ward and Harrison, as borderline candidates due to the fact so many Hall of Fame voters are statistics-focused, would benefit significantly from one more ring. One more Super Bowl victory would guarantee Roethlisberger a spot in the Hall of Fame. Only now is Roethlisberger truly being valued outside of Pittsburgh for the greatness that has been on full display since his rookie season. The Steelers fortunes changed the day he took over under center, and the team has not looked back even for a second. The prevailing belief Roethlisberger was along for the ride during the Steelers' 15-1 regular season his rookie year and during their first Super Bowl run the following season was always a myth. Only one quarterback who has won two Super Bowls, Jim Plunkett, is not in the Hall of Fame. No quarterback who has won, or even played in, three Super Bowls is not in Canton. If the Steelers win this year’s big game, the discussion on Roethlisberger’s Canton credentials is over. Like Roethlisberger, Polamalu would lock in his Hall of Fame reservation with one more title. He is the most exciting defender in the NFL, a high energy player who makes plays all over the field. He is one of those rare defenders so good offenses build their entire game plan around him. With two Super Bowl rings and a few highlight reel plays in the playoffs, Polamalu is well on his way to the Hall. But, a third Super Bowl win would seal the deal in the event his career were to be cut short at some point down the line. The discussion of Ben Roethlisberger's Canton credentials will be over with another Super Bowl title. Nobody wants that third ring more than Hines Ward, the ultimate Steeler who has epitomized Steelers football for his entire career. While he is in the downward slope of his career, playing a strong second fiddle behind young sensation Mike Wallace, he is still tough, plays his heart out on every play, and inspires everyone around him to be better. Ward may be the best blocking wide receiver in the history of the NFL, and he remains the heart and soul of the team. Ward should already be a lock but would probably miss out on the Hall of Fame due to his numbers significantly trailing some of his contemporaries, like Marvin Harrison and Terrell Owens, due to the Steelers run-first offenses. But would anyone in their right mind take Owens over Ward? Ward makes his team better while Owens makes his team a dysfunctional mess. One more Super Bowl would guarantee Ward a place in the Hall, even though I think his body of work has already earned him a place there. And he is playing like he realizes it, recognizing the window of opportunity is rapidly closing in on him with Father Time knocking on the door. Mike Tomlin may jokingly call him “old man” after the games, but Ward still plays with the same fiery intensity he has shown from day one. Like Ward, James Harrison needs one more ring to punch his ticket. He was a special teams ace on the 2005 Super Bowl team and the dominant defender on the 2009 Super Bowl team. He has an NFL defensive player of the year award to his credit and played to that same level this year, even as he became the poster boy for the NFL’s crackdown on tackling. What will hurt Harrison is his career started late, which means his stats, like Ward’s, will trail some of his contemporaries. But, a third ring would nullify that problem. And all that bad publicity Harrison is getting this year? It will probably help him after his career is over and will actually build his image in voters’ eyes. Harrison is virtually unblockable off the edge and is held on almost every down, although it is almost never called. It is almost as if the refs don't think it is fair for a tackle to try to block him one-on-one so they are willing to cut them some slack. And he is a complete player who is equally devastating against the pass and run. Making the top defensive play in Super Bowl history doesn't hurt his cause, a play that will be replayed over and over again for the rest of time. He was arguably the best defender this past week during the divisional round of the playoffs. There are a number of other veteran Steelers whose legacy would also benefit from another title, although they likely would fall short of Hall of Fame consideration unless they cashed in a couple more times. Aaron Smith and Casey Hampton fall into this category, assuming Smith returns for the Super Bowl. Being a Steeler sometimes means getting less credit than you are due because of the role you play. Smith, Hampton and Heath Miller are all near the top of their position, but they rarely receive the accolades they deserve outside Pittsburgh. If big Casey Hampton raises his finger again this year, he will one day enter the discussion for the Hall of Fame, especially considering the defense's incredible record at shutting down the run. Because of how good the Steelers have been against the run over this stretch, Hampton has a shot. He has been the rock in the middle of the line for both Super Bowl wins. And, while he no longer has the speed to chase Eddie George down the line and hammer him like he did early in his career in a playoff matchup, he is still an unmovable force in the middle of the line. Unfortunately for him, defensive linemen are measured by sacks and a 3-4 nose tackle isn't going to build his fame in that way, instead eating up blockers so that other players get to make the sacks. But, if you want to know why nobody can run against the Steelers and some teams don't even try, start with Hampton as the keystone to their modern version of the steel curtain. Some of the younger Steelers have showed a tremendous amount of talent but are too early in their careers to project out that far. Players like Lamar Woodley, Mike Wallace, Lawrence Timmons and Maurkice Pouncey fall into this category. Still, a Super Bowl ring will not hurt their cause as they continue to build their resumes and all will benefit from playing with a franchise quarterback at the top of his game for at least five more years.While these individual accolades will always take a back seat to the team's and city's goal of winning championships, Steelers' fans have grown accustomed to seeing their gridiron heroes inducted into the Hall of Fame on a regular basis. One more Super Bowl win will ensure this parades does not come to an end any time soon. The Pittsburgh Steelers and the New York Jets will meet for the second time this season in the AFC championship game on Jan. 24th at 6:30 PM in Pittsburgh. Although the Steelers won the statistical battle in their 1st encounter, the Jets won on the scoreboard 22-17. Pittsburgh had many opportunities to win the game, even with 2 seconds left in the game and the ball on the Jets' 10 yard line, but they couldn't make the play. This meeting will be somewhat different in that Mark Sanchez is more experienced and has been making better decisions. Coming off an upset 28-21 win over the New England Patriots, the Jets have shown marked improvement since the 45-3 beat down they got from the Patriots in the regular season. Also missing for the Steelers in the 1st game was tight end Heath Miller and strong safety Troy Polamalu. Both are healthy and will play in the championship contest. The big difference in the first time these to met was the opening kickoff was returned 97 yards for a Jets' touchdown. Special teams have been a problem for the Steelers all season. These two teams are very evenly matched on defense and both offenses have been shaky at times. Whoever comes up with the "Big Play" will most likely win this came. Special teams could also be a factor again. Here's a video of the last time the Steelers played the Jets. A throw for the ages set up the winning score, which came amid a violent collision and pileup at the goal line. That’s just the way you’d both want and expect Ravens-Steelers Part III to end, right? But neither calm nor convention was part of the equation in this AFC divisional playoff game Saturday afternoon, a game that featured bad blood, questionable calls, big plays and a familiar ending: Pittsburgh somehow finding enough magic to advance, and Baltimore lamenting offensive miscues and coming up short despite a monstrous defensive effort. Believe it or not, a 31-24 game was basically dictated by the defenses. The Ravens scored a defensive touchdown in the first quarter and set up another with a second-quarter fumble recovery deep in Pittsburgh territory. The Steelers rallied from a 21-7 halftime deficit by returning the favor, forcing a pair of turnovers to set up relatively easy scores and holding the Ravens to minus-four yards in the third quarter. The second of Rashard Mendenhall’s two short touchdown runs goes in the books as the game-winner, but a third-and-20 pass from Ben Roethlisberger to rookie Antonio Brown for 58 yards at the two-minute warning set it up. The Steelers’ defense didn’t get a dramatic stop at the end — T.J. Houshmandzadeh just flat dropped a fourth-down pass that ended the Ravens’ final drive — but did swing the momentum of the game in the third quarter when Ryan Clark forced a fumble and then intercepted a Joe Flacco pass, both in Ravens territory. A typically violent Steelers-Ravens game started with Hines Ward getting flagged for unsportsmanlike conduct on the first play from scrimmage. Terrell Suggs, who got two of his three sacks in the first half, led a Ravens front that seemed to be battering Roethlisberger on his every pass attempt. The Ravens took a 14-7 lead when Suggs hit Roethlisberger before he could throw late in the first quarter, and almost every player on the field froze, thinking the loose ball was a result of an incomplete pass. Cory Redding alertly picked it up and basically jogged 13 yards into the end zone. Five minutes into the second quarter, Ed Reed recovered a Mendenhall fumble at the Pittsburgh 16 and set up a Joe-Flacco-to-Todd-Heap touchdown pass. Flacco was next seen on his back under a pile of black jerseys, and he spent much of the third quarter there. James Harrison sacked Flacco on the Ravens’ first play from scrimmage, the first of three sacks he had in the second half. In a game that was bully on bully from the start, the Steelers started gang-tackling and swarming the way the visitors had early, and the Heinz Field crowd responded. How good were the defenses? The teams combined for 11 sacks. The Steelers averaged 2.3 yards per rush; the Ravens averaged 1.9. But for as unblockable as Suggs was in the first half — and he left the Steelers’ offensive line looking as dumbfounded as referee Jeff Triplette did for most of the day — Harrison was even better in the second half. And he had help. With lynchpin end Aaron Smith out, young Ziggy Hood pitched in with five tackles and a sack. Clark broke up two passes and had two tackles for loss in addition to the turnovers. Harrison finished with seven tackles, three sacks, three tackles for loss and two pass breakups. A third Baltimore turnover, a Flacco fumble recovered by Brett Keisel just two plays after Ward’s touchdown, set up a 35-yard Shaun Suisham field goal with 12:15 left. Billy Cundiff tied the game at 24 with 3:54 to go on a 24-yarder as the Steelers’ defense held despite the Ravens having first-and-goal at the 8. The Ravens thought they’d scored the go-ahead touchdown at the six-minute mark on a punt return by Lardarius Webb, but a holding call on Marcus Smith as Webb got to the sideline brought it back to the Pittsburgh 29. Only getting three points gave the ball back to Roethlisberger and set the stage for the late, improbable heroics. Zac Jackson is a frequent contributor for FOX Sports Ohio. Labels: AFC playoffs, Heath Miller, Hines Ward, James Harrison, Mike Tomlin, Pittsburgh Steelers, ravens. Baltimore Ravens Pro Bowl linebacker/defensive end Terrell Suggs created a buzz this week by wearing a controversial T-shirt, which showed a Raven making a not-so-nice gesture to the Pittsburgh Steelers. Was it over the line or just Suggs having a little fun? Dan from Hanover, Pa., writes: Suggs' T-shirt choice is unfortunate. It is unsportsmanlike and is a horrible example to his younger fans. To his credit, he's been pretty civil with his words this week, but the shirt was definitely over the line. Dan from Lynchburg, Va., writes: I love the Suggs T-shirt. Where do I buy one? That's is how all us fans feel about the other team and city. That's what makes this such a great rivalry. Suggs has continued to talk about winning a championship for the fans, this shirt is for the fans. Joe from San Antonio, Texas, writes: I think it's a classless display. Terrell Suggs has won nothing worth mentioning as a Raven, and wasn't it just last year he struggled with sacks? Plus, it's not just adult males that follow the Ravens, it's kids, some of whom probably look to players like Suggs as a role model. He needs to go back to Communication 101. There are other ways of, ahem, expressing yourself. Ryan Morrison from Baltimore, Md., writes: I think that the shirt is just him having some fun. People in Baltimore have been looking at these shirts for a couple years now and it's not surprising to us. But i guess the rest of the world sees it different. Mutt from Warrenton, Va., writes: There is no need for trash talk in this rivalry. Both teams are tough and not intimidated by the other. I am left to assume that Suggs is either nervous or just a loudmouth. David from Salt Lake City, Utah, writes: "Hey Terrell," I couldn't help but notice there is no ring on that finger! Ethan from Reisterstown, Md., writes: I don't think Suggs' new shirt is meant maliciously. It's just the general attitude the fans have for each other - not in real life, just in jest. I mean, really, any fan of the Ravens pretty much hates the Steelers, and I'm sure in Pittsburgh the reverse is true. Darrell Thompson from Fort Worth, Texas, writes: I think this is a way of Suggs staying loose. These two teams have a lot more class than what's going on in the AFC East. Peter from St. Andrews, Scotland, writes: He can say what he wants. He hates the Steelers, I hate the Pigeons. That doesn't mean I don't respect them for being as good a team as they are, and I'm sure he feels likewise about the Steelers. After the way Ben Roethlisberger shrugged him off in the game-winning drive in December, he has no choice but to respect! And no disrespect to Suggs for that play, he was a beast in that game! Joe Brewer III from Columbia, S.C., writes: Sure, Terrell Suggs may dress louder, but who hits harder? We'll see who gets the W.
You knew fans from the AFC East wouldn't mind their business this week. Anonymous Patriots fan writes: All the trash-talking for what? I thought you do that after you win? Don't worry, Ravens and Steelers. Do all the trash-talking you want. Both of you will be watching the Patriots win another ring. The Pittsburgh Steelers came to Cleveland Sunday and played football like the Steelers we all know and love. On the Cleveland Browns 2nd play from scrimmage after the opening kickoff, Troy Polamalu flew in to pick of a Colt McCoy pass. It was obvious that the Steelers were about to make a statement with this game. On the very next play, Ben Roethlisberger connected with rookie wide receiver, Mike Wallace for a 56 yard touchdown pass. The Steelers would score 5 touchdowns and a field goal on six consecutive drives before they would have to punt. The result, a 41-9 beat-down to put an explanation point on their season! With a 4 to 6 game suspension of quarterback, Ben Roethlisberger looming before the start of the 2010 season, most experts did not pick them to make the playoffs. The Steelers won 3 out 4 without Ben and with Ben the went 9-3. This Steelers are starting to come together at just the right time. Knowing they had to win to get the 2nd seed and a bye week in the playoffs, the Steelers played inspired football. They were concerned about the health of Polamalu and Aaron Smith, but Troy played like he was already at 100%. Good new for the Steelers, bad news for the competition. Pittsburgh will play either the Indianapolis Colts or the Kansas City Chiefs at home in the 2nd round of the playoffs. Go Steelers! Got Penn State gear?